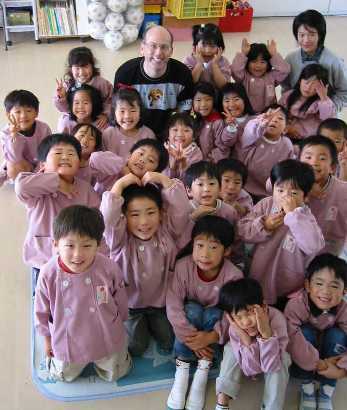 My first visit to a Japanese kindergarten was a great experience! Shintoku Kindergarten in Kofu City in Yamanashi Prefecture seemed like it would be a friendly place when I looked at its web site before my visit. Ms. Kyoko Sakurai, the head of the kindergarten, sent me e-mails before my visit explaining that she is the fourth generation to lead the kindergarten. Both her great-grandmother and grandmother, whose photos decorate the assembly hall, had been directors of Shintoku. Ms. Sakurai greeted me in front of my hotel with a kind smile on her face. When we arrived at the kindergarten, I felt like I already knew the place from the photos on the kindergarten's web site. When we went into the office, the first thing I noticed was a boy lying on a bed. I waved at him, and he waved back slowly, obviously not feeling well. The new Blue-eyed Doll received by the kindergarten in February of this year was sitting on the bed next to the boy, along with some other stuffed animals and dolls. I remembered how Ms. Sakurai had explained in an e-mail note that she thought it was important to let the children play with the doll so they would feel close to it, even though the doll might not last for many years. Before the welcome ceremony at 10:15, we took a tour of the kindergarten. I almost did not make it to the welcome ceremony, since I bumped the top of my head twice going through doors. I felt like I was back in kindergarten as Ms. Sakurai and an office worker examined my head, applied some ointment, and put on a small Band-Aid. The rest of the day I successfully navigated the door frames by bending slightly my six-foot body as I went through them. The 200 children, most between three and five years of age, welcomed me with some words and a song. Ms. Sakurai spoke a few words of introduction, explaining my long trip by plane and how she met me by means of "electric waves" (i.e., the computer). Three children then put around my neck a beautiful necklace of origami cranes. I then talked to the children about where I came from, how to shake hands, the American holiday of Halloween, and a few English words. They were excited to see a cute white Halloween ghost called Spooky, which I had brought as a present. I explained to them the different containers and bags used by American children to get candy on Halloween night. About half of the children jumped up with excitement when I showed them a huge orange plastic bag used for fallen leaves and told them that children who really loved to get a lot of candy used a bag of that size. 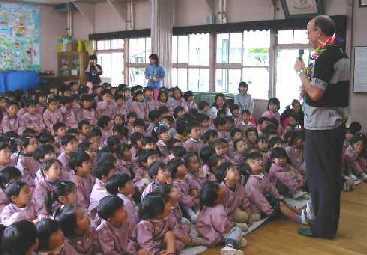 During my presentation, I learned quickly how challenging it can be to control a crowd of 200 excited kindergarten children. 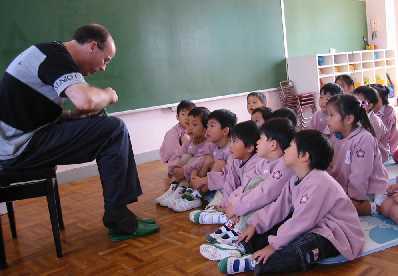 The teachers kindly helped me two or three times to quiet the children down so I could continue. After the welcome ceremony, I visited each of the eight classes to show the children a couple of picture books about shapes and to answer their questions. They enjoyed matching the shape in the drawings (e.g., turtle with an oval shape) to one of ten shapes that would appear one by one in a small opening on the page. Afterward, they quickly learned how to say the English word for the shape, with many already knowing the English word "star." Before I went to Japan, my wife Noriko had recommended the matching shapes book for children of kindergarten age. She also helped me a lot on how to speak Japanese to a group of kindergarten children, which I had never done before. She has an excellent sense of what children enjoy after working for about 15 years in Japan as a kindergarten teacher. About 20 years ago I taught a Sunday school class of five-year-old children for about six months, and I remember how flexible I had to be since the attention span of small children is usually not very long. In the afternoon after lunch I went to play with the children on the playground. I found out quickly that I had to keep moving to avoid being mobbed by 20 or 30 children who always surrounded me. I had lots of children following me down the slide and up to the top of the jungle gym. Several of the girls were quite good at jump rope, so I took a turn also. We also played the children's version of soccer, but there was no concern for any rules. I also received a pocketful of "gifts" from the children, which included acorns and advertising fliers. In the mid-afternoon I had time to rest with a nice chat for about an hour with the 15 teachers at the kindergarten. They each in turn expressed their thoughts about the day. 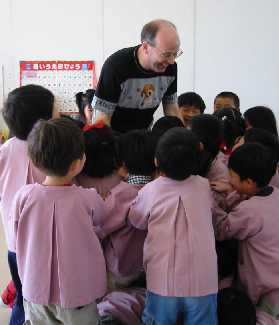 One teacher mentioned that they get almost no men visitors at the kindergarten, so the children were happy to be with someone like their father. Ms. Sakurai was very kind to give me a book and video celebrating the 100-year history of the kindergarten. She also gave me copies of the booklet and other information that came with the kindergarten's Blue-eyed Doll, Evangeline, in 1927. When I first saw the doll, I had the impression that the actual doll seemed quite old and worn in comparison to the beautiful photo of the doll that I had for several months on the top page of my Friendship Dolls web site. For each class I visited, Ms. Sakurai showed her energy by bounding to the top of tables and cabinets in order to take photos of the children in each class (click here to see a couple of these photos). I hope someday soon I will have the chance to visit Shintoku Kindergarten again.